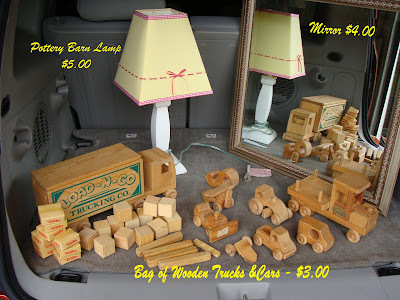 For years I've always talked about wanting to "hit the yard sales", but it seemed like all we did was slowly drive by and say, "Don't see anything!" 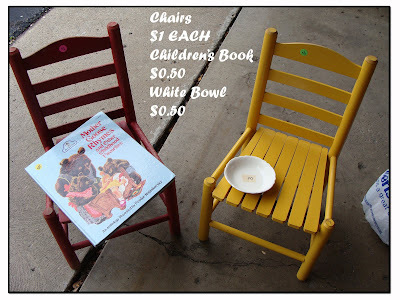 But after reading other blogs about some of the things being found at yard sales, thrift shops and "junking" . . . I knew this was something I had to get in on! My mom is visiting from Michigan so I dragged her out with me today! 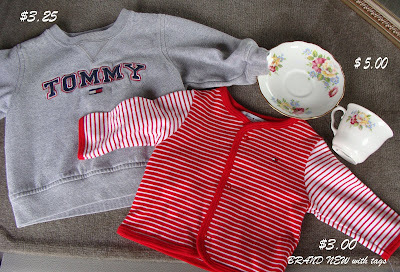 Out of nine yard sales, we found some great bargains at four. So, you can see I made quite the haul for a mere $31.25!! With success like this, you can be sure I'll be back out there again!!! Just remembered -- this Sunday and Monday all "blue tagged" items are 50% off! Will definitely check that out as well! Think I'll put my feet up for a while . . . it's been a busy day! Look at you go, girl! You really hit the jackpot your first time out. Glad you got out there to see for yourself & now you're convinced too! I'll be having the party again on Monday. Thanks, Rhoda! 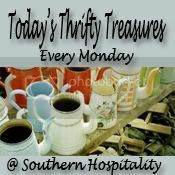 I'll definitely be posting this post out on your "Thrifty Treasures" on Monday! That's why I went ahead and included it at the bottom of my post! Sounds like you're hooked on garage sales now! Didn't you find that it's great for getting things for the little ones? You scored big on that lamp! Love the cake plate and the little chairs. I bet that yellow one will look sweet in your garden! You should be hooked NOW! I love the chairs! Happy Thrifty Monday. Jackpot.....and on your first time out!! Isn't it so fun to come home with beautiful things for such a small price! I love the chairs, I have a couple myself. One I hung on the wall with a plant on it and the other is in my kitchen. The cake stand and platter are beautiful. Great finds! I love those chairs and also the cake stand and platter. Good Job! I'll bet you can't wait for next Saturday. Fabulous finds! You did really well for your first time out! I particularly love the platter and the cake stand. Now imagine if you had purchased all that in the retail stores. Yikes! 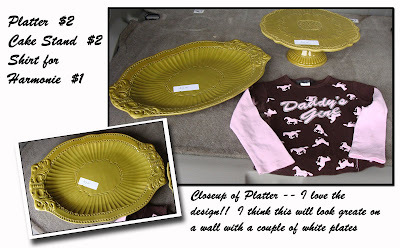 That yellow platter and stand will look great with a coat of spray paint! !